Thin, but not too thin! Without an underwater camera, a driller’s job would be almost impossible – trying to do anything with a drill pipe in deep water – while blind – is incredibly tricky. So, the JOIDES Resolution’s camera is in high demand, and its capabilities are constantly being improved and added to. In this blog, IODP Engineer John Van Hyfte takes us on a tour of “the best underwater camera in the world”! In the dark old days (literally) science drilling ships relied on sonar to help them locate the borehole in relation to the drill, and it could take days to enter and re-enter funnels. Back then, the funnels had sonar reflectors on them that bounced a message up to the ship’s sonar, guiding the ship into position. It was time-consuming, and therefore costly. 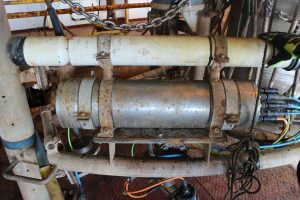 The crew of the JOIDES Resolution has used an underwater camera to help re-enter the borehole for several decades. However, John and his team of engineers and technicians are constantly improving its imaging capabilities, using fibre optics and electrical hardware for it to capture high-definition live footage. 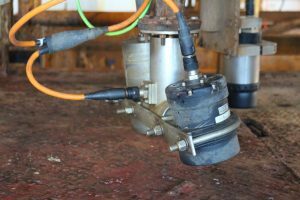 Most other drillships have an ROV, but these are extremely expensive to operate and maintain, so the JOIDES Resolution has focused on investing in a VIT camera, which stands for ‘Vibration Isolated Television’. Our footage can be recorded and replayed in standard and high definition too if we need to revisit it. 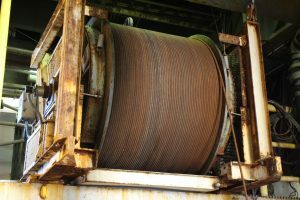 The VIT is lowered and raised using a very strong cable, called an ‘umbilical’ that has 4 optical fibres in it, as well as 2 sets of twisted pair copper electrical wires so it can carry electrical power to the cameras and sensors, and carry a lot of data back up to the ship. The umbilical is about 7,000 metres long, although we only use about 5,000 metres for safety reasons. 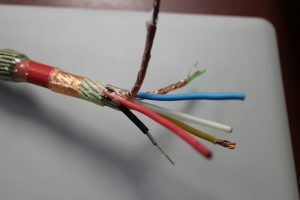 Many years ago, before we had fibre optic we used copper lines to carry the television signal from the seafloor, but the time latency was several seconds. This made it hard to put the ship into the correct position, allowing the driller to put the drill pipe back into the borehole. Down deep, there are strong currents (sometimes in different directions) and the ship heaves up and down in the swell above too. The drill pipe has to go through these currents to get back to the borehole. Without a television system, this would be very difficult to accomplish. 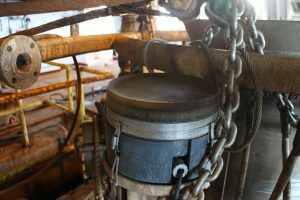 To lower the camera down through the sea to the seafloor we attach it to the drill pipe on the moonpool floor and lower it with a winch through the moon pool. 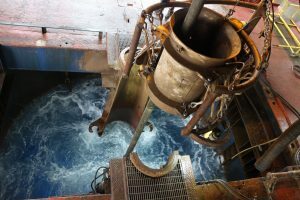 The moon pool is a 6m diameter hole in the middle of the ship through which we lower the drill pipe, re-entry funnels and camera. When it is not in use it is covered for safety reasons. 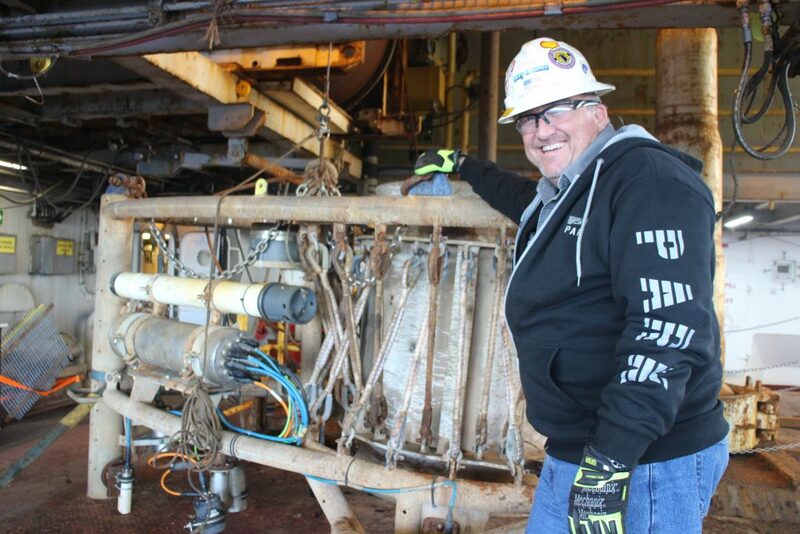 The VIT camera clips around the drill pipe and is lowered down through the ‘moonpool’. The Toolpusher sits in the ‘subsea shop’ just above the moonpool and controls how much umbilical is let out. The driller operating the drill pipe can watch how the drill pipe is going on a TV in his office (called the Doghouse) on the drill rig floor. 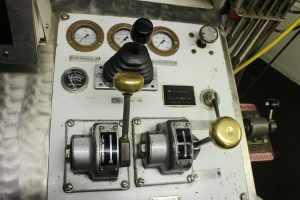 The camera can pan (move left or right), tilt (move up or down) and zoom, and this is controlled by the Captain and Chief Mate in the DP office located on the Bridge. DP stands for Dynamic Positioning. That way the Captain can control the camera angle to get the best view, and quickly adjust the ship’s position to optimise the re-entry and drilling. This is the survey camera, a high definition camera that can pan, tilt and zoom. This is the telemetry pod, which has electrical power and sensors in it. The umbilical gyroscope measures the direction of the frame and which way it is pointed to get the best camera angles. The VIT camera also has a sonar altimeter on it so we know how far off the seabed we are. John and his team have great plans to add more to this camera platform. There aren’t many cameras in the world that go down up to 5km deep (3.1 miles) multiple times at the same site. Sometimes for up to 2 months in one place as well. The VIT frame could be altered so it becomes an oceanographic instrument as well as a drilling tool by adding sensors to measure the water temperature, conductivity and depth in the water column.